I understand and realize asking this question on a Hummer Forum is like asking for what I get ..... Well, here I go anyway. 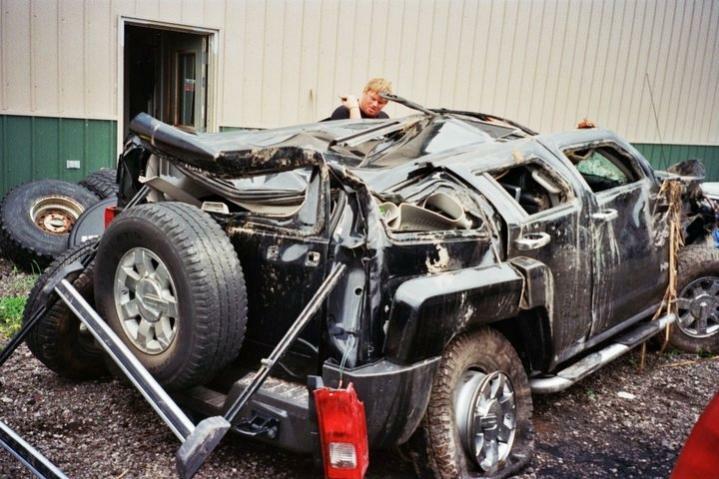 How many of you bought your Hummer for safety and confidence reasons? Or to * feel * like your safe ... Higher up, looking down and the imposing image of the Hummer that says " Don't f__k with me." The last few months, after re-locating to So. Florida, agressive drivers and two verbal threats while driving my Prius ... I don't know why, but people think I am some kind of squirrel lover, tree hugger wimp of a man. My former residence of No. Florida, people respected others and obeyed traffic signals. I've never lived in a place before now where people jaywalk at all hours wanting to be killed, or at a stop light and some Bum approaches my Prius window demanding a cigarette, and after I said no, he calls me an *******. That said, I was forced to arm myself ( have CCW permit ), and thinking about buying a Hummer H3 Alpha V8. My Toyota Prius gets great mileage, at least 40 MPG city. Hummer H3s get around 18 city. However, being high up off the ground and more protected, I feel I am forced to move to a SUV, for the feeling of confidence living in a major metro area. I like the Hummer H3 Alpha but not sure if it's worth the hassle and extra $ to sell my Prius and buy a Hummer. My buddy wants to sell me his H3 and I can afford it ... just not sure if it's wise to make the change with gas prices looming in on $5 gallon. Last edited by Ray66; 05-24-2012 at 12:14 AM. I forgot to add that So. Florida is Hit & Run Capital of the world. And because of the high influx of immigrants, and many people don't have auto or health insurance, and are illegal. Just in the past year, I've seen or heard of at least 12 Hit and Runs, and I reside in a wealthy area of So. Florida. I love my Prius to death ... Starts every time and 40+ MPG city, but I also value my life and the lives of my passengers and/or family, and want to be protected if some drunk illegal immigrant t-bones me after picking up my kids at school. That said, which would you rather be, the hammer or the nail ... ? My Dad was hit from behind, in his 2011 Tundra Extended Cab 1/2 ton Truck - he felt a little budge, while the crash dummies behind him suffered serious injuries from the head on collision., and they were driving a small hybrid Honda. Last edited by Ray66; 05-24-2012 at 01:37 AM. Can't speak about the virtues of a Prius, but I certainly can speak about the safety of an H3. 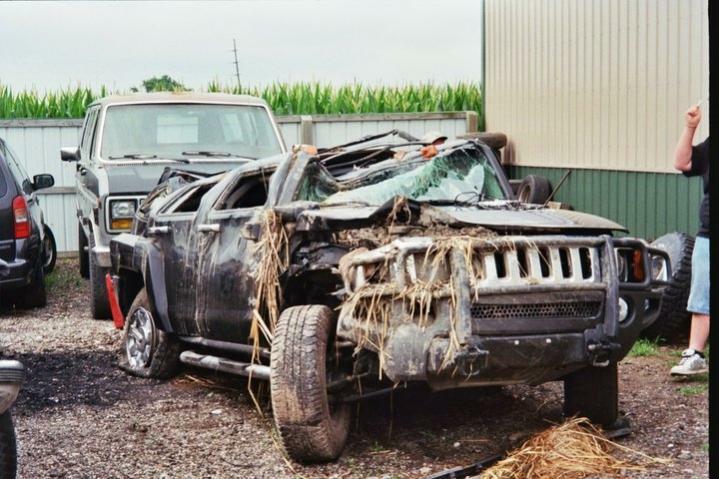 On July 3, 2010 my wife, two children and I were involved in a terrible accident. We live in a rural area of Michigan. Traveling down a two-lane paved road at 55mph and a driver in a full sized Chevy 4x4 decided to ignore a stop sign and hit us in the driver's door at about 60mph. The impact tore the left rear wheel off and caused us to roll over. We ended up flipping on our roof into the bottom of a 14' deep ditch. My two children (11 and 10 at the time) did not have any broken bones. They both had welts from the seat belts and my son got several stitches above his one knee from flying glass. My son was in the back seat on the driver's side and took the brunt of the impact. He was unconscious for several minutes hanging upside down in his seat belt. He did regain consciousness and both children are fine today. My wife and I both suffered fractured vertebrae and several herniated and bulging disks down the entire length of our backs. We also had several broken ribs and head injuries. My wife's left wrist was severely fractured, requiring a large plate with pins and screws to reconstruct it. Neither of us has any paralysis. We are continuing physical therapy three days each week and see our physiatrist, neurologist, neurosurgeon, and endocronologist each month. To date, the only surgeries we have had are my wife's wrist and ongoing pain management procedures such as epidural injections and Radio Frequency Ablasion, which is basically a procedure to "burn" the nerve endings (facets) that exit on each side of the spinal cord. Every emergency worker, and even the wrecker driver who pulled our Hummer from the ditch, told us that we owe our lives to that H3. I too can speak for the safety of the H3. Although my accident wasn't nearly as serious as mgoblue85's, I was please with the results. A vehicle pulled across an intersection in front of me. I didn't even have time to hit the brakes. In an instant I was thirty feet to my right facing the opposite direction. The air bag deployed, the flashers came on, the doors unlocked and an Onstar advisor was asking me if I was okay. The only injury I had was a small cut on my right leg. If I had been wearing long pants I probably wouldn't have had that. Nothing is bulletproof, but for it's reasonable size, I think the H3 is a good choice. My accident was on a Saturday, it was declared totaled the next Tuesday and I had a brand new one by Friday and have since traded that one for a 2010 Alpha/Offroad. I would borrow or rent one for a weekend and see how you like it. A hummer H# alpha does not get 18 mpg around town. That is for sure. We have the best of both worlds. A hummer and a hybrid (accord).Both safe cars imo. People really can't understand what that part of Florida is like until they live there. I spent 5 years in Pembroke Pines working in Miami so I know what you are saying. To answer your question, I bought my H3 then H3T because of it's blend of great offroad ability and on-road manners. Safety and confidence reasons were never part of my decision. Compared to other real SUVs (not SUV shaped mini vans), the H3 mpg isn't horrible. S. FL stop and go traffic isn't going to help, but the Alpha should be within 1-2 mpg of the I-5 so don't let mpg decide which engine you get. ...because of the high influx of immigrants, and many people don't have auto or health insurance, and are illegal. Sounds like Texas to me ! For one thing, no Hummer gets 18mpg in the city, and I would think that something else is more suitable for you. It does not sound that you have a passion for a Hummer, or that you want a capable off road vehicle. There are alot of choices out there. Try your friends H3 out for a day or two. You might fall in love with it, but then again you might not even like it. It all comes down to choice, and I choose and love my Hummer. 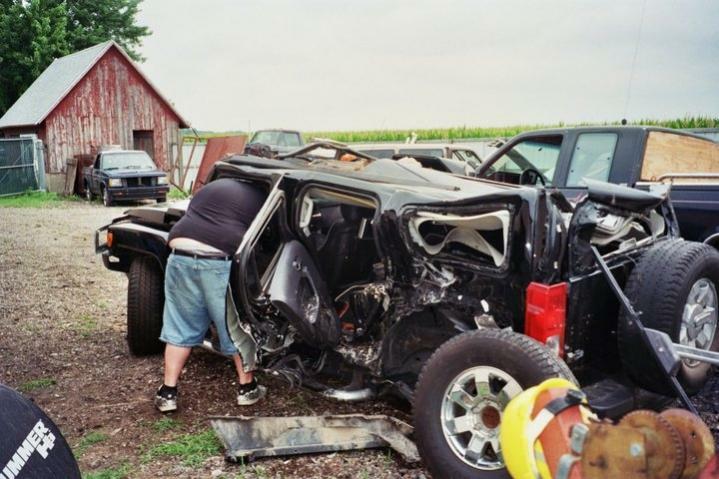 One of my friends also had terrible accident when his family was in his brother H3 when another vehicle hit them in the side,. They also rolled over several times, but, thank to God, all of them are okay! So it's a really good and safe vehicle!